Hey lets go to the beach! We loaded the Mini with a picnic and headed for the coast, 226 feet below sea level. There was a lot of rain the last few days so the sky was exceptionally clear and there was fresh snow on the San Jacinto Mountains in the distance. 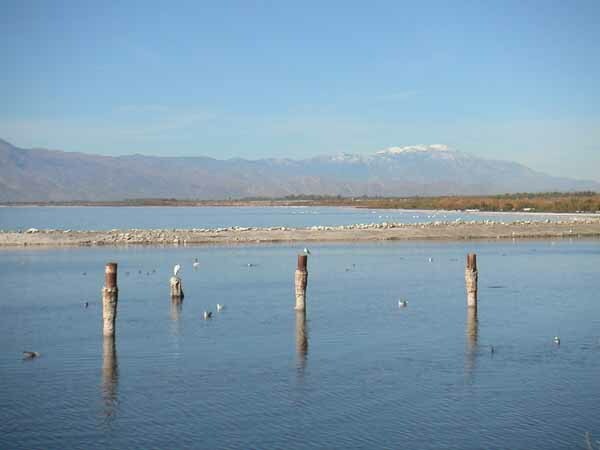 Our first view of the Salton Sea included a large flock of majestic white pelicans – much bigger than the sea gulls. We learned there is a type of sea gull with a web foot that only lives at the Salton Sea. 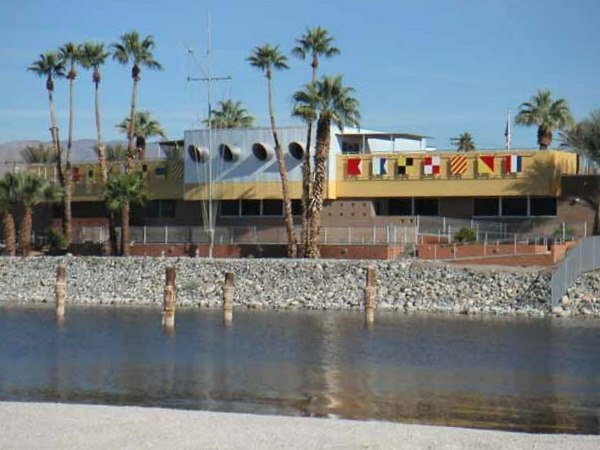 The North Shore Beach and Yacht Club was designed by Albert Frey and was recently renovated. It was really a brilliant nautical design and a pleasure to experience. You could image Lucy and Desi hanging around with their pals Sinatra and Dean, with the harbor full of yachts, bustling with activity. There are plans afloat to bring back some boat races. My Dad said he swam here (with my Mom as hisÂ young bride) in the 50’s when he was on a day leave from the Marines (before the yacht club was built)! I am not sure I am brave enough to swim in it today – it is quite a bit saltier (25% saltier than the Pacific Ocean). We headed as far south as the Sonny Bono National Wildlife Refuge to enjoy our picnic lunch on top of Rock Hill. We watched a large flock of snow geese covering an entire field. We observed quite a few grebes, black bellied plovers, black-necked stilts, great blue herons, and American Bitterns as well as more sea gulls. We drove back to the condo the same direction, enjoying the early winter twilight – it was a 180 mile day trip so one we will probably not make again. This entry was posted in Architecture, California, Palm Springs. Bookmark the permalink.